Bifacial solar panels harvest not only direct sunlight on the front, but also scattered and diffuse light from the back, for example light that reflects from the surface on which the panel stands. These bifacial panels have a transparent glass back sheet instead of the reflective white back sheet of traditional monofacial panels. However, some of the advantage of harvesting light from all directions is lost, precisely because of the transparent back side of the bifacial panel. In a monofacial panel, light that hits from the front between the cells reflects on the white back side and can still be harvested by the cell. In bifacial solar panels, this light is lost because it is transmitted through the glass back. ECN researcher Bas van Aken has solved this issue by placing a white mask around and between the cells of a bifacial solar panel. "This white layer reflects light back onto the cells just like the white layer of monofacial solar cells. The advantage of our architecture is that we can still harvest light from both sides as with a regular bifacial solar panel. We combine the advantages of white back sheet reflection with the ones for bifacial light harvesting," Van Aken explains. In a first test, Van Aken produced a white bifacial solar panel using regular solar cells. This panel performed better in a standard test measuring the maximum power output (Pmax) than a regular bifacial panel. Moreover, the front side of the new panel showed the same Pmax as a monofacial module. Overall, the white bifacial solar panels showed 5% better performance than regular bifacial panels. The advantage of white bifacial panels over monofacial panels depends on the location of the installation and can be as high as 15 to 35%. 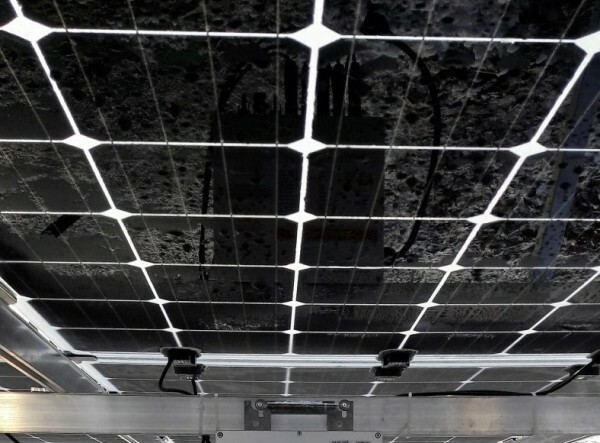 "We have proven that white bifacial solar panels can compete with monofacial panels in standard tests and that they show an increase in annual energy yield," says Van Aken. "The next step is the production of these panels on an industrial scale, followed by large scale tests." This newsitem was published on the ECN website on 16 June, 2016.